Although the words "fleece jackets" and "fleece pullovers" are used interchangeably, there is a difference between them: fleece jackets have a full zipper front where as fleece jackets with a half or ¾ zipper fronts are called fleece pullovers. Fleece jackets (fleece pullovers) and fleece vests, or the ability to design your own embroidered fleece pullover or vest online is offered by many embroidery, promotional products and decorated apparel companies. Crooked Brook is neither a decorated apparel nor a promotional products company; it is a label used by the atelier division of our art studio. Our shop is a full-service apparel design, pattern making, sample making, and small lot production atelier. In addition, we offer fleece pullovers and fleece vests, that you can customize with embroidery or embroidered patches. Custom embroidered fleece pullovers and vests have always been a great way to build brand recognition or to promote your business, product, cause, institution, etc. However, to some people (since it is a give away), this means buying the cheapest fleece pullover or vest they can find. When you buy a cheap fleece pullover, that is exactly what you get… a cheap fleece pullover. Cheap fleece pullovers are dull, thin and pill after only a few washes. It is better to spend a few more dollars on a fleece pullover or vest that will be worn, instead of being relegated to the bottom dresser drawer. 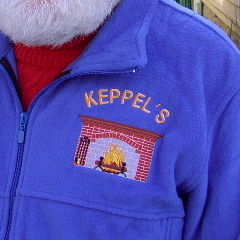 Numerous decorated apparel, embroidery and promotional products companies offer "Cheap Fleece Pullovers" or “Embroidered Fleece Vests - $9.99". Custom fleece pullover prices are determined by the brand, style, fabric content, weight and quantity in addition to the complexity of the logo or design and method of customization.